Henry Ferland, co-director of the GMI ASG, and Swarupa Ganguli, Team Lead for the U.S. EPA’s Landfill Methane Outreach Program, at a biomethanation plant in Pune, India. In October, a delegation of representatives of GMI’s Municipal Solid Waste Sector and Administrative Support Group (ASG) conducted a scoping mission to India in support of GMI’s work there. The delegation visited several cities, including East Delhi, Pune, and Coimbatore, met with representatives of the national and local governments, and observed innovative solutions to waste management challenges in all three cities. With a sizable district population of 1.3 million, East Delhi faces ongoing challenges to managing its solid waste, including tracking logistics. GMI visited the Ghazipur landfill and waste-to-energy (WTE) plant, the Okhla composting plant, and the Timarpur Okhla WTE plant with municipal officials. Despite being at full capacity, the Ghazipur landfill continues to receive waste from East Delhi. The city has implemented a small pilot LFG energy project that collects gas across 4 hectares of the landfill. Electricity generation is expected for use on site by the end of the year. Meanwhile, the Ghazipur WTE plant produces refuse-derived fuel (RDF) from the 500 tons of waste it receives each day. Currently, the RDF is provided free of cost to local industrial facilities that are testing its effectiveness in direct-use applications. In the future, the RDF will be used to generate electricity at a yet-to-be completed power plant. The Oklha composting plant treats raw municipal solid waste from neighboring areas in South Delhi. The plant treats approximately 500 tons of waste per day using the wind-row composting technique. The composting process is completed in 40 days, and the compost is sold to farmers in bags or by the ton. The Timarpur Okhla WTE plant receives approximately 2,500 tons of waste per day, which it incinerates and turns into electricity using a boiler. The WTE plant has an electricity generation capacity of 16 MW, which the city then sells to the grid. 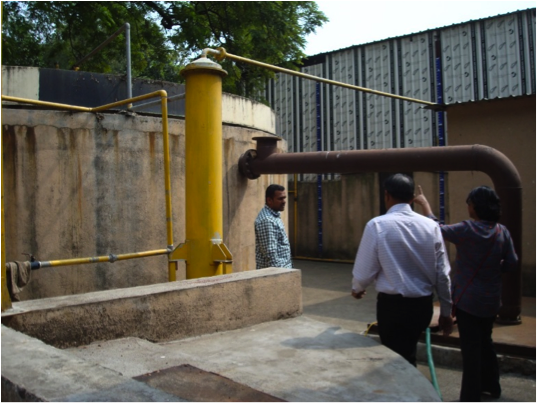 One of 20 small biomethanation plants distributed throughout the city of Pune, India. The city of Pune has a decentralized anaerobic digestion program termed biomethanation for the treatment of organic waste from hotels and apartment buildings. Today, the program consists of 20 biomethanation plants operating at full capacity (10 tons per day); another 5 plants are in the process of being commissioned. The GMI delegation visited one of the city’s biomethanation plants located adjacent to Peshwe Park. Every day, the plant receives and treats 10 tons of organic waste that is collected from hotels and apartments and manually treated to remove contaminants. The plant currently generates 500 cubic meters of biogas per day, enough to produce approximately 40 kilowatts of electricity. The electricity is used to power public lighting of parks and streets. The Coimbatore Municipal Corporation (CMC) operates a waste segregation program in 20 of the city’s 100 wards. The GMI delegation visited one of these wards to observe the program in operation. In that ward, 14 two-person teams use push carts to collect waste in the designated areas of the ward to which they have been assigned. Two-person teams collect and segregate waste in Coimbatore, India. Each team collects waste from approximately 300 households, six days per week (from Monday to Saturday). The waste is segregated by the sanitation workers at the point of collection into different categories: organic waste for compost or biomethanation, organic waste for fuel, mixed paper, high-grade plastics, low-grade plastics, cardboard, glass bottles, and carry bags. These segregated materials are then taken to a collection point where they are weighed and recorded. In addition to an established monthly salary, the sanitation workers receive payment commensurate with the amount of materials they collect. Storage bins for sorted waste materials, awaiting recycling or reuse. The materials are stored at the collection point until they are sold to third parties, such as scrap dealers and recyclers. When one ton of a specified material has been collected, that material is picked up at the collection point. For materials that have been accumulated in lesser quantities, the operators sell the materials at different markets. In addition to scrap materials, cardboard, white paper, and bottles, some organic waste is sold for re-use. For example, recovered coconuts are reused to make activated carbon, straw, and mosquito repellents.